Yuki Kawauchi: Meet the marathon-running government clerk who’s a national hero in Japan. Yuki Kawauchi is a world-class athlete, a full-time government clerk, and a Japanese national hero. Could he change the way we think about running? Yuki Kawauchi crosses the finish line to set a marathon record during the Sydney Running Festival on Sept. 16, 2012, in Sydney. Quick, who is the world record holder in the marathon? No Googling. OK, I’ll make it easier—name any distance runner. Depending on your age and interest in running, Haile Gebrselassie may have popped to mind, the archetypical Ethiopian running 10k to and from school with books under his arm. Perhaps you went with a woman: Switzer, Benoit Samuelson, or Waitz. And maybe you thought of elfin Bill Rodgers flying around the corner onto Boylston Street in a Sharpie-lettered T-shirt, or the defiant and doomed Prefontaine, or wraith-like Abebe Bikila, gliding barefoot through the streets of Rome. All of these runners’ careers are studded with epic victories and records. But unlike the current marathon world record holder, Kenya’s Patrick Makau—about whom even I, a running geek, know nothing aside from his marvelous time of 2:03:38—these athletes inspired generations of runners due to the strength of their personalities and their stories. (Rodgers was a smoker when he started running but said the exercise dulled his appetite for nicotine.) Lately, distance running has succumbed to the allure of impossibly fast times set by a quick-flowing stream of anonymous, interchangeable, sponsor-wrapped blades, slicing seconds off the world record. Times are faster, but who cares? Two hours and three minutes is not inherently interesting—people are. Enter 26-year-old full-time government clerk Yuki Kawauchi of Saitama Prefecture, Japan. While Kawauchi’s 2:08 marathon best can’t compare to Makau’s 2:03, his unconventional methods and stubborn seclusion from corporate interests have energized the sport in a way no other modern athlete has. An enthusiastic runner during his university years, Kawauchi was brushed off by corporate teams upon graduation because they felt he didn’t have the talent for professional running. Undeterred, he ran on his own, for pleasure, training around his 40-hour-per-week job and racing on the weekends. He entered his first marathon in 2009, finishing in a respectable 2:19. Encouraged, Kawauchi entered another marathon a month later and bettered his time by a minute. Conventional strategies dictate a two-month buildup in training for a marathon and about a month of recovery, making four 26.2 mile races per year a full schedule for a top runner. Elite marathoners may race just once or twice a year to ensure they’re both fit and rested enough to give a supreme effort. In 2010 and 2011, by contrast, Kawauchi raced nearly every weekend at distances from half-marathon to marathon, even completing a 50k ultramarathon. That calendar notwithstanding, he progressed from impressive citizen runner to impossible-to-ignore elite performer, crossing the line in 2:08:37 at the internationally competitive 2011 Tokyo Marathon. He came in third, first Japanese, beating the many professional runners in the field. This brand of fun, and his stubbornly independent methods—“[I want] to find out whether the common sense of the running world is really any kind of sense at all,” he told Larner in 2012—explain his frequent racing, though he has admitted that his performances may suffer for it. Still, Kawauchi is adamant about doing things his own way: racing often, paying for his own kit, and being back at the desk on Monday. He estimates his training expenses at about $12,500 per year and once paid $9,000, about three months’ salary, to get a last-minute flight to a marathon in Egypt. Corporate runners receive a salary, as well as gear, coaching, health care, travel, and entry fees. At this point, given his popularity, race directors are offering to pay Kawauchi’s travel expenses and waive his entry fees, and he could probably live off his prize earnings. But the citizen marathoner has chosen to structure his life as if he ran in an era before star athletes profited from their fame. He says his clerking job broadens his perspective, forces him to train more efficiently, and makes him keen for those long weekend runs. It’s also part of his iconoclastic persona. His is a unique strategy for any 2:08 marathoner and all the more unusual in tradition-heavy, protocol-laden Japan. As much as fans love him, Kawauchi is not as popular with those in Japan’s pro system. Getting bested by a self-coached auto-didact with a full-time job does not sit well. He is besieged by reporters at every appearance and takes the opportunities to do some saber-rattling (“2:06 is within sight”), as well as to remind young runners that signing on with a corporation is not a prerequisite to success. Tension escalated during the selection process for the 2012 Olympic marathon team. 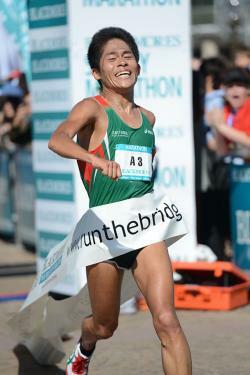 Kawauchi was, once again, the first Japanese at the 2012 Fukuoka Marathon, one of the Olympic qualifiers. Despite the fact that he had beaten all the professional runners, who had access to the best gear, coaching, and facilities, the Japan Association of Athletics Federations said Kawauchi’s time of 2:09 was too slow for London. Though he was not chosen for the Japanese Olympic team, all of this back and forth only elevated Kawauchi’s folk hero status and deepened his commitment to a seemingly impossible schedule. In 2012, he entered nine marathons, winning five of them, and six half-marathons, coming in first in three. He also set the course record at a 50k ultramarathon. So far in 2013, he’s run at least 15 races of half-marathon distance or longer, including his marathon best of 2:08:15. On June 16, he came in first in yet another 50k. At the finish line, according to Japan Running News, he collapsed and had to be taken to the hospital. The Kawauchi Effect can also be seen internationally. Kawauchi says he has invitations from more than 100 races, including many outside Japan, in the coming year. Race directors are willing to wait in line, some until 2015, to get a piece of him. Despite his outsider status, JAAF named Kawauchi to its marathon team for the world championships, to be contested Aug. 17 in Moscow. The cameras will undoubtedly focus on the lead pack of uniformly knife-thin gazelles. But further back, spectators—perhaps a government worker with a desk job, maybe a middle-of-the pack college runner or a gangly high school student with big dreams—will strain to see a spiky-haired, muscular striver, teeth bared, giving it everything he has.